Not all mailboxes are created equal. At least, not in my neighborhood. When I lived in Texas, my mailbox was a nondescript, local hardware store product mounted on a steel pipe driven into the ground. When I moved into my house, there, I had to buy my own because the former occupant took the mailbox with him. Things are different in Georgia. There are lots of people from all over in the Atlanta area. Many are from places where there is so much snow and ice that having grass in a yard is considered a major accomplishment. When these people move to Georgia, they discover a long growing season, garden supply stores, Lowes, and Home Depot, stores with shelves heavily laden with yard stuff. They also sell decorative mailboxes. My neighbors are from all over, and have beautiful yards and decorative mailboxes. When we moved into our Georgia house, the previous owner left his non-decorative mailbox because it was ugly, and the wooden post was anchored in concrete. After a while, the wooden post rotted through and fell down. If your mailbox is on the ground, the mailman will not give you anymore mail until you fix the problem. This happened to me after a couple of years. My solution was to rush to Home Depot, get a new wooden post, and jam it into the ground. I was in a hurry, and did not do the concrete thing. Over the next twenty years, my mailbox developed a rustic lean, and I decided to see how long it would take to rot and fall down. The neighbors did not criticize me, much, about my cruddy, leaning mailbox. Some of their kids laughed at me, and one of them offered to help me install a new one. I think his mother put him up to that. The post never did rot all the way through, probably because it wasn’t embedded in concrete, and the soil around it drained the water away from the post. The only reason I had to replace it was because it had to be moved to make way for a tree that was being cut down. When I went to Home Depot to get a new mailbox and post, I told the salesperson that, 1) I didn’t want to dig a hole, and 2) I didn’t want to use concrete to support it. Not only am I lazy, but I am a lot older and handling digging tools is not right for a respected gentleman of my age and standing. The new wooden post has a three-foot length of angle iron driven into the base, with two feet available to be driven into the ground. Uh oh, it leans even more that the old one. 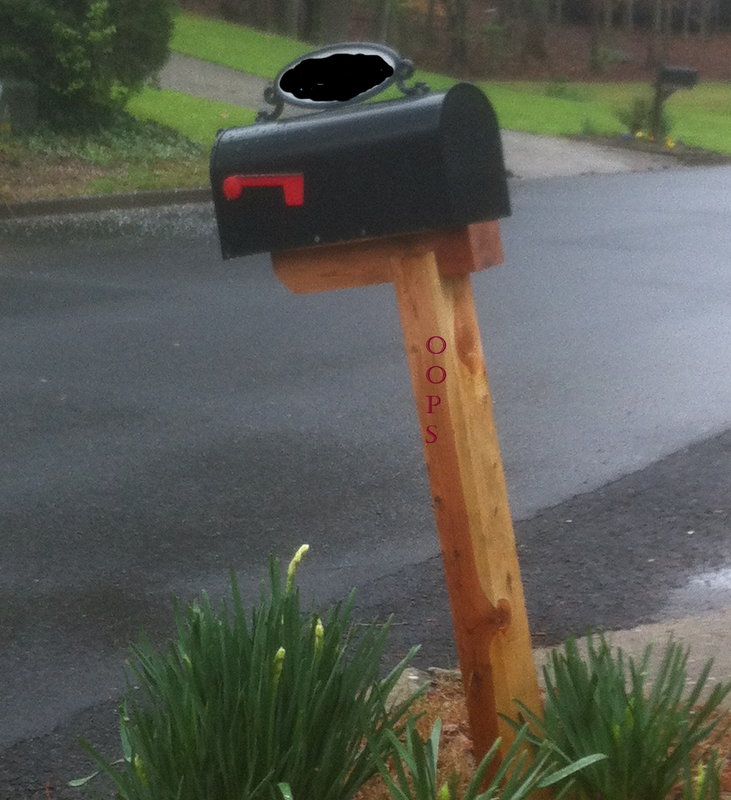 The ground is wet and soft this spring, and my new mailbox post is leaning at about fifteen degrees off vertical. This “no concrete” thing is not working, this time. I sure do have good neighbors. Maybe this will keep them from going postal. If I had a choice, my mail box would be in the shape of the first Enterprise, lol! We got tired of ours being banged around but idiots who love to drive by homes and knock em down. Well, now we have a very think metal pole holding ours up and no one has messed with or tried and failed. Sadly, some of my neighbors are still waking up and finding theirs tattered and knocked completely to the ground. 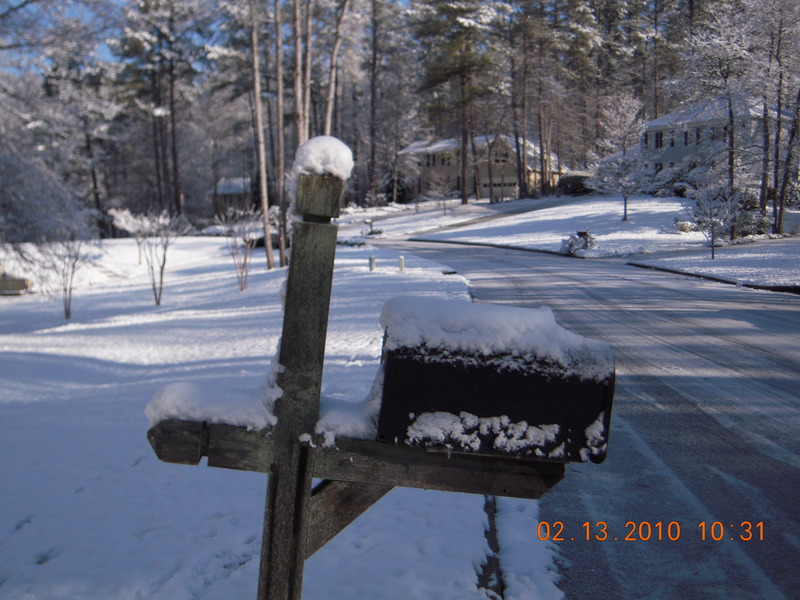 Why do you and MK want to see a picture of my poor little mailbox? Frankly, it is embarassing. Let me see what I can do. I took a picture of it yesterday with my iPhone.